Spoiler Alert: He whips it out. Director and co-screenwriter Guy Ritchie's re-imagining of the King Arthur myth isn't tongue-in-cheek enough to work as a Monty Pythonesque comedy, but doesn't take itself seriously enough to be a respectable contender in a world where "Game of Thrones" exists. 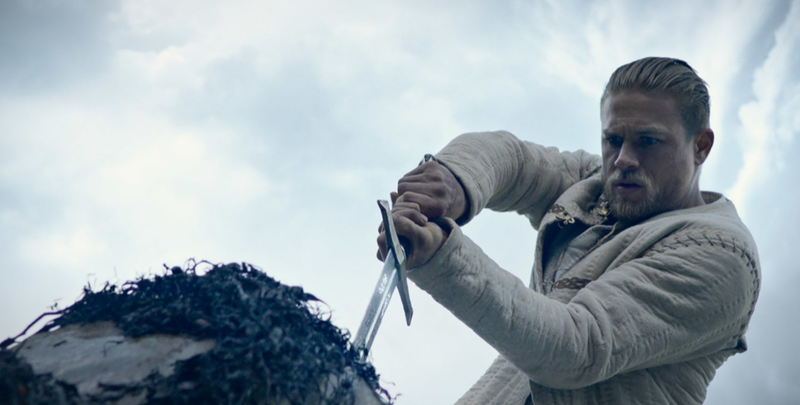 Despite a big budget, decent special effects and a quality cast, "King Arthur: Legend of the Sword" feels unconvincing, unnecessary and instantly obsolete. Charlie Hunnam is the title character, although obtaining said title takes up most of the running time. After escaping death as a small child at the hands of his evil uncle Vortigern (a fittingly nasty Jude Law), who has killed Arthur's parents in a sorcery-fueled coup, the "born king" is raised in a Londinium brothel with no knowledge of his royal roots. Following a zippy montage showing his hard-knocks transformation from meek kid to hustling hunk, he gets his chance to have a go at pulling Excalibur from the stone. In this version of the story, successfully doing so puts him at war with Vortigern, who wants Arthur and every other member of the resistance to his cruel reign wiped out. Arthur's holed-up-in-the-woods gang and other supporters of his cause are so eye-rollingly diverse that the movie's attempt to cover all racial bases is somehow more offensive than if the legend had been played as the traditional #ArthurSoWhite. Djimon Hounsou and Drake lookalike Kingsley Ben-Adir apparently are African-Anglicans, and Tom Wu plays an Asian martial-arts instructor nicknamed (no lie) Kung Fu George. A goth-mopey female mage (Astrid Bergès-Frisbey) sent by the missing-in-action Merlin does the spellcasting. If the producers had thrown in a transgender troll and a handi-capable dwarf, they probably could have gotten funding from PBS. The plot ranges from unlikely (instead of killing Arthur as soon as his identity is revealed, when doing so would be effortlessly easy, Vortigern opts for a later public execution in close proximity to a sword that Vortigern knows is magic) to clumsy (tiresomely recurring flashbacks). Ritchie's fight and flight scenes are so frenetic they often are incomprehensible. Also, how Vortigern has managed to wipe out most of the country's mages, despite the fact that they can conjure up things like the mountain-sized monstrous elephants seen in the movie's opening and a grotesquely writhing snake-topus creature, is a complete mystery. The period-inaccurate designer armor and other costumes are elaborate and stylish enough to be at odds with the more down-to-earth settings, but they definitely look good. Likewise, the fiery father-killing fiend that Arthur fights in his final act face-off is a Frank Frazetta fantasy brought to life. And Arthur's first "George McFly makes a fist moment," when he's had enough and causes an explosive dirt-quake that incapacitates a rather large number of attackers, is impressive. Taken as a whole, though, the movie is so hyper and jokey and frustratingly phony, right up to a final gag that sounds like the threat of an equally unappealing sequel, that you may want to give this misbegotten myth a miss.